Designed and Made in the USA – and built to last! Our Teardrop Fountain Stool Model 1700-782NS features a scalloped ring swivel seat, chrome column, and teardrop base. Available in your choice of standard and designer vinyls and optional foot ring. Teardrop colors are available in (2) standard powder coat colors: Red and Black. 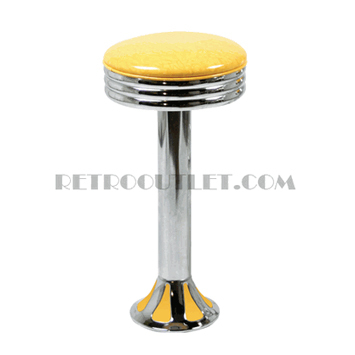 Four additional colors are available at an additional charge of $15 per stool: White, Blue, Pink and Yellow. Be sure to specify the type of flooring upon which the stools will be mounted. Each type requires different hardware and wrench (all provided at no additional cost). Minimum order of seven (7) stools for Teardrop colors other than Standard Red or Black.